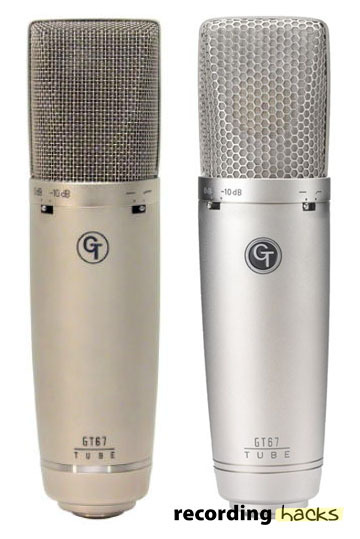 The GT-67 is a multipattern tube condenser — essentially, a multipattern version of the GT-66 Cardioid tube condenser. 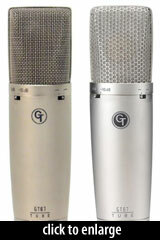 It was for several years the flagship microphone in the Groove Tubes line. The GT-67 uses components familiar to the GT product line: a 32mm, center-terminated true condenser capsule with Aspen Pittman’s disk resonator system, a custom-wound nickel-core output transformer, and a GT6205M vacuum tube-based impedance conversion circuit. The mic has very high sensitivity, 35 mV/Pa, making it useful for quiet sources at the possible expense of clipping on very loud sources. The mic has a switchable -10dB pad to provide extra headroom in such cases, giving it a max SPL (padded) of 140dB. A switchable high-pass filter provides a -12dB rolloff below 75Hz. The mic provided four polar patterns: Cardioid, Omni, Hypercardioid, and Figure-8. From what we can discern, the polar pattern is selectable via a pair of mini toggle switches on the rear of the microphone body (confirmation forthcoming), rather than from the power supply. Cosmetic changes during the course of the product’s lifetime included subtle finish and logo changes, and a change to the outer layer of grille material. The GT67 included an elastic shockmount (p/n SM4), a power supply, a 25-foot cable, and a hard mount (p/n HM1). The supercardioid and cardioid polar patterns on the GT67 were interesting to play with. Both seemed to have a significant rear tail at high frequencies, and the cardioid setting was very much wider than the supercardioid option at middle and low frequencies. The provision of this extra [supercardioid] switch increased the flexibility of the mic, and I found I tended to use the supercardioid mode when close miking, to maximise separation. More distant sources — and especially those that tended to move — benefited from the cardioid setting. The Groove Tubes GT67 is also known as: GT-67.